Happy Mother's Day to all moms most especially to my mama, Anabelle and my late grandma Nina. Words are not enough to express how much grateful I am for what I have become today because of you. I hope I was able to show her love and affection to my lola when she's still around especially those times of difficulties battling for cancer. I'm trying all my best to give well-deserve attention and care to my mom. 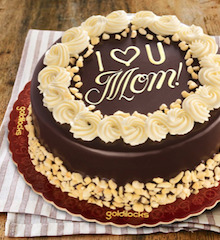 One of the advance Mother's Day gift she received was a classic, round, limited edition black-forest cake from Goldilocks. Made with lots of curly chocolates that looks like a mother's crowning glory, with cherries on the forehead and cheeks. These sweet and sour fruits is bursting with nutrition, known to relieve arthritis pain. More chocolate to create the eyes, nose and her lovely smile. Truly, a sweet treat to our mom on Mother's Day. Goldilocks also offered Carrot Walnut Cake – if your mother has always been the reliable bedrock of your life, earthy and wholesome. Chocolate Sansrival – if she’s always been the spark of any gathering, celebrate her zest for life with this. Share with us your coMoMments, not only on Mother's day but everyday. Make it a habit to say "I Love You".